A wonderful review of the last show on The Shipwrecked House tour, at StAnza Festival. I really had a wonderful (but too brief) time in Saint Andrews. Claire Trévien’s one-woman show is StAnza at its best. Seeing her poetry come to life was not only an impressive spectacle, but also bloody terrifying. 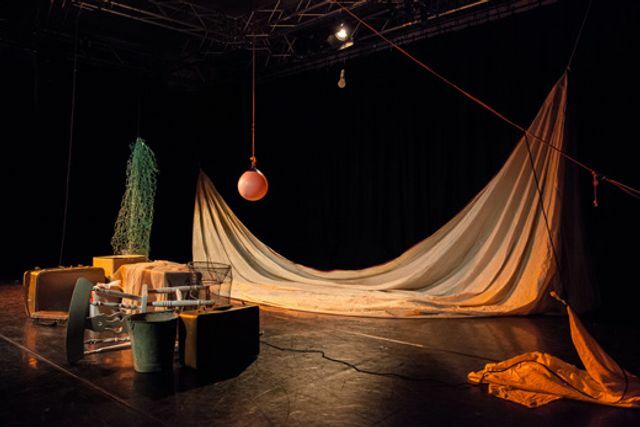 Turning the Byre partly into an abandoned home full of memories and partly a shipwreck, the stage was covered with an array of sheets representing sails and cloths covering old furniture. Combined with the sound of a brewing storm, this created a haunting atmosphere that intensified throughout the performance. [...] Trévien’s theatrical poems are a magnificent piece of modern art. The dark and troubling atmosphere created by this performance left an impression on me I will not soon forget.